Sr Bernadette Nealon FMSJ and Lillian Dajoh with their awards. 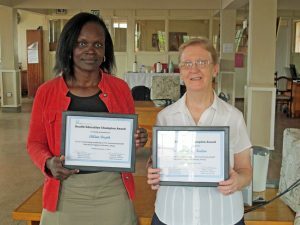 An American NGO which provides health information to underdeveloped areas around the world has honoured Irish Franciscan Missionary of St Joseph, Sr Bernadette Nealon, for her leadership in community health education in Kenya. The Limerick city native was presented with the World Information Resources for Education and Development (WiRED) International’s Health Education Champion Award for Outstanding Leadership in the Community Health Education Programme in the Kisumu region of western Kenya. Sr Bernadette Nealon arrived in Kenya in 1998 to work with disadvantaged communities. “I came to work in the Archdiocese of Kisumu and was given the mandate to work in the informal settlements of Kisumu city. I was shocked at the living conditions of the people, but I was overjoyed at their joyfulness, spontaneity and the care they gave to those in need from the little they had,” she said. In 2002, the Community Health Information Centre was established starting with a focus on HIV/AIDS, and has expanded to a broad health education programme on a wide range of critical topics. Sr Bernadette uses WiRED’s health education programmes to train community health workers, who, in turn, train community members in home-based care for bed-ridden clients and also trains people who are caring for children at home. The centre provides facilities for students from medical schools to use the modules to conduct their research and prepare for their exams. Students can study on their own at home, then visit the centre to be tested on the material. Many live a long way off, so access through the download programme stands to expand the reach of these health education courses considerably. WiRED is a US-based non-profit organisation has been delivering medical and health education to conflict-affected and under-developed regions since 1997. It provides health education by delivering programmes, equipment, and co-ordinated instruction in remote regions across 15 countries. All of its educational programmes are technology-based and peer reviewed. Complete health training programmes can be operated in remote communities entirely on solar equipment, thereby, opening health education to people who have been left behind by other programmes. WiRED resources – online and on portable media – are cost free to users. The WiRED International e-library of more than 300 medical and health education modules enables physicians and nurses, patients, health workers and communities to address the prevention and treatment of both infectious and non-communicable disease in developing areas of the world. The more than 300 topics are as diverse as maternal health and hand washing, rheumatic heart disease and Ebola, clean water strategies, and home caregiver training. With these interactive training programs, communities and medical professionals alike can educate themselves through the material released on its website and also distributed on portable media for communities off the grid. 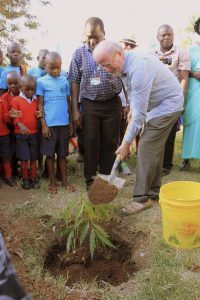 Matt Moran planting a tree at the KUAP site in Kisumu, Kenya in 2014. In a tribute, Professor Gary Selnow, Executive Director of WiRED said he had been working with Sr Bernadette and the staff at Pandipieri since 2002. He added that in addition to the larger impact she has had by way of the Pandi organisation, she has demonstrated the power of helping people one-to-one. “On several occasions, I have seen her reach into her purse and generously give her own money to a mother who needed medications for her child and to a young man who needed tuk tuk fare for a ride to the hospital. She has a paltry income and yet she shares it so freely with the neediest in the community.” He said Sr Bernadette had inspired his own work to provide health training in low-resource regions around the world. “Warm congratulations to Sr. Bernadette and Lillian on the awards recognising their inspiring work” he said.